Chill out with the funniest family comedy of the year! 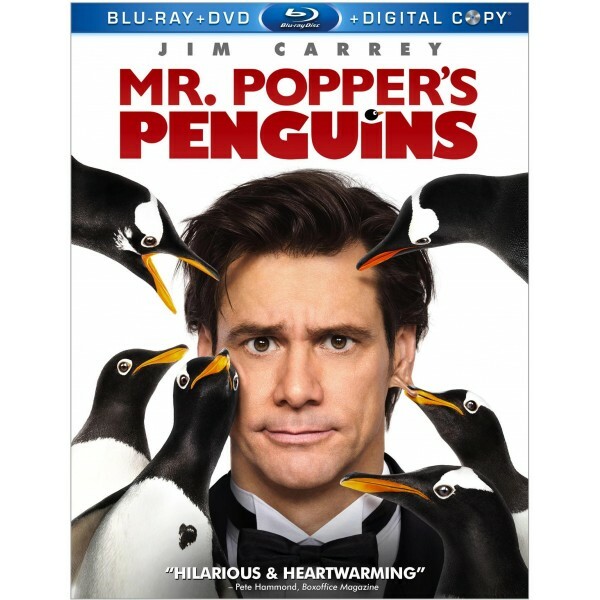 Jim Carrey stars as Tom Popper, a successful businessman who’s clueless when it comes to the really important things in life...until he inherits six “adorable” penguins, each with its own unique personality. Soon Tom’s rambunctious roommates turn his swank New York apartment into a snowy winter wonderland — and the rest of his world upside-down. Adapted from the award-winning classic children’s book, Mr. Popper’s Penguins is a cool blast of fun for all ages! We are really enjoyed Mr. Popper's Penguins! I was actually surprised at how much the kids loved it- all three of them have watched the entire movie from start to finish several times. Aiden (age 9): I like the penguins. They were funny. And they had funny names. Stinky. hahahahahahaha (etc.) And that guy [ aka Jim Carrey ] makes the craziest faces ever! Olivia (age 5): I like the part where they put a whole bunch of snow in the house and there is a whole bunch of ice in the house and they slide! Penguins are clearly a hit in our household. Jim Carrey is always hilarious and Doug and I laughed our way through this film too. There is a ton of special features on the disc with "Nimrod & Stinky's Antarctic Adventure" topping the list as our family favourite. I also really enjoyed the gag reel and The Legacy of Mr. Popper's Penguins. This movie is really 100% family friendly and would make an excellent film for family movie night. It would also make a great Christmas present for pretty much anyone!